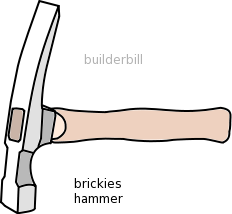 A hammer usually with a square head and with an opposing chisel for cutting bricks and stone. Hardened steel masonry cutters that are fitted into hammers and chisels. They come in 35mm or 50mm widths. Hand or machine operated chisels that can receive scutching combs for dressing masonry. 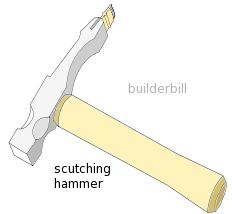 Above is a standard brickie's hammer with the cutting edge. Note that it is an edge, very similar to a carpenter's firmer chisel. That is to top face is flat and the underside is bevelled. 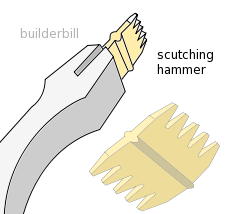 The chisel edge is for cutting bricks in a particular direction. Also note that the head of the hammer is square. Don't confuse these with the similar looking geologist's hammer, which has the end coming to a point. The one at the top right is a hammer with a scutching head and below that is a detail of the same. The scutching combs are bought in packets and when they are worn they are thrown away. 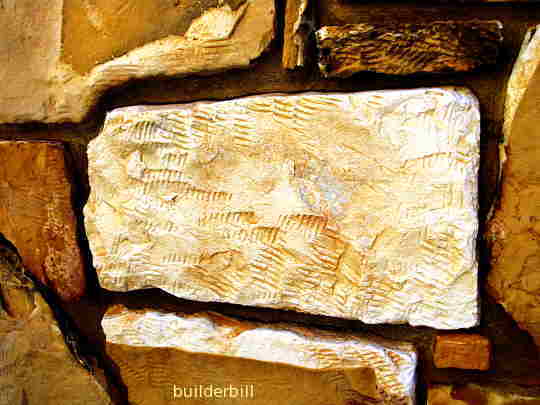 Here are some tool marks made by a scutching hammer on a piece of rubble masonry.